The GTV250 is about as close to clothing as one can get and still have wheels, a motor and a gas tank. Riding down the road at 65+ mph, one of my first impressions was the fact that you actually can’t see the scooter you’re riding on, any part of it at all, except for the mirrors. It’s like you’re seated on some kind of invisible machine that is propelling you down the road — you can feel the handlebars, throttle, brakes, etc., yet you can’t see them. It is a very strange feeling from riding a motorcycle or a maxi scooter, as you can definitely see more of your conveyance. GTV 250 with nearly 5000 commuter miles in less than a year. Paint is still immaculate. This is an unchanged part of scootering. The style of the GTV250 is unmistakably old-school, from the headlight in the fender to the exposed bars, the beautiful leather seat, chrome, instruments and riding position. A scooter from the mid-50’s will have most if not all of these traits, but in a package with technology 50 years behind what is available today. The non-retro part involves not shifting, stopping securely, never buying 2-cycle oil and spending no real time fixing it. My ride had 5000 miles on it within the first 8-9 months of its life, and it was as solid as anything I have ridden lately that is brand new. Fit and finish are undeniably solid, and the mechanicals are well thought out and reliable as a quartz watch. I’ve restored 26 automobiles in my life and love old stuff. I spend 50% of my riding time on a 36 year old Moto Guzzi, and understand what the hard-core vintage scooterist is thinking. “They don’t build them like this now”, “in 50 years mine will still be running but this new Vespa will be turned into Campbell’s Soup cans, etc. I just can’t help but think they’re wrong. Most of the Vespas made in the 50’s are in my pantry now, along with most of the airplanes, ships and automobiles of that era. Sure enough there are some sweet, sweet survivors and some wonderful barn-finds waiting to happen, but really most of them are gone. The “keepers of the flame” that restore and lovingly maintain the old scoots are definitely heroes in my book, but frankly, anyone that thinks the new scoots don’t belong are fools. The original intent of a scooter is for a person to get from place to place in an efficient time, with a machine that is economical, reliable and easy to operate. Vespa’s been doing this for half a century. They have been improving the breed every chance they’ve gotten throughout this period as well. Even most hard-core vintage scooterists are loathe to ride the early models with complex shift linkages and lower power. There are certain models that are “better” for different styles of riding, and many scooters have been “modified” from their original specifications to make them easier to ride, more powerful, better handling and braking, etc. Vespa did the same thing, except this involved engineers, testing and advanced manufacturing methods. They took time to find out what the customer’s needs were and how they had evolved over time, and built models to suit those needs. They didn’t leave the vintage scooterist behind — they gave this extremely loyal and zealous group a nod throughout the design of the BV250, but now its wrapped in a modern package that meets the needs of the modern rider wanting a scooter for it’s original intent. The GTV250 is a masterpiece of everything that Vespa knows about making scooters, molded and modeled into a package that gives you all the modern conveniences, safety and features, and wraps it into a brand new and affordable package with a warranty, dealer network and the satisfaction of being in a green machine that meets all applicable pollution-abatement standards in Europe and the US. I could go run an errand and stuff it’s cavernous interior with items, park just about anywhere, and snake through traffic to the point that it became a non-issue. I could go to work or enjoy a nice ride in the twisties, ride with friends, meet up and share the scootering experience. Finally, I could “arrive” somewhere. Motorcycles which are most definitely a personality statement, don’t hold a candle to scooters in the “this is who I am department” — when you stop and park it somewhere, with friends, acquaintances or even complete strangers, you are approachable, and many are jealous of your freedom. Some ask, thinking that they “want” to scoot too, others talk to you nervously about it, knowing that it’s something that they’d love to do but they are “not at the right point in their lives”. They are chickens, or at best, not in touch with what is possible. There are few people that I wouldn’t recommend a scooter like a Vespa GTV250 to. You just need to answer a few questions. Does most of your transportation needs run within a 20 mile radius of your home? Are the roads in this radius paved? Do you spend 80%+ of your time alone in your car? Is it possible for you to still have fun? Do you understand that although Scootering is dangerous like any two-wheeled activity, if you have proper training and don’t act like an idiot you’re probably not going to ever get hurt? I think I could find a few more questions, but if you’ve answered these above as “yes”, you should probably get some training, get a Vespa and start enjoying yourself. You’ll get the retro feel with the GTV all day long, but you’ll also get serious reliability and performance, utility and economy. You get all this, and your fun comes for free. 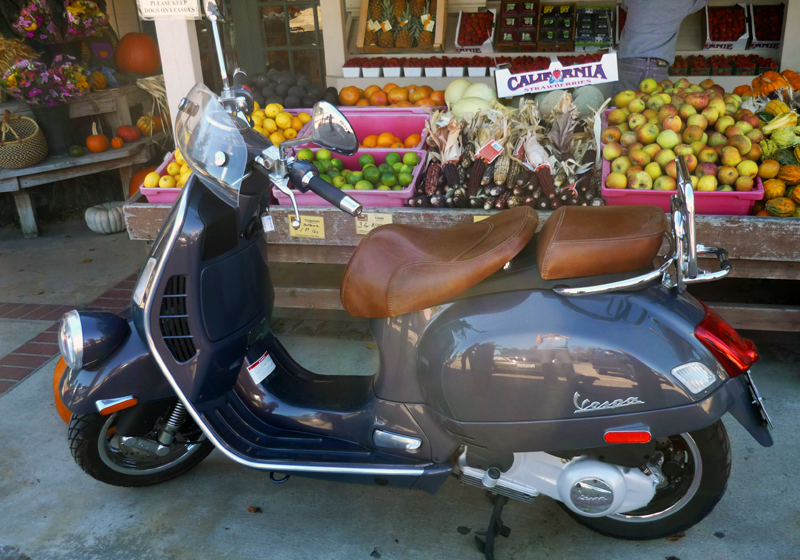 This entry was posted in bike reviews, scooter reviews, scooters and tagged 250 Vespa, fuel injected scooters, modern scooters, Retro Vespa, Vespa, Vespa GTV250, vespa review. Bookmark the permalink. 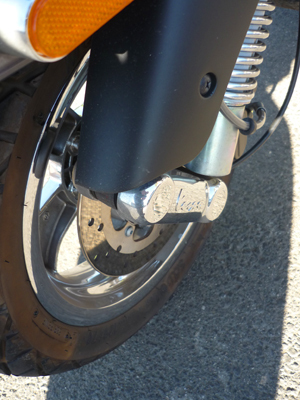 Nice write up–helpful in my evaluation of a new scoot. Thanks for the time and energy!